Multifunction rules the roost with this truly versatile Canonbury storage credenza. Ruddy espresso and earth toned faux slate highlight a rustic twist on mission style. Windowpane glass cabinet doors and sides offer peek-a-boo storage of everything from entertaining essentials to extra linens, video games and movies to dog walking gear and shoes. Spacious cabinet top displays cake plates and candy jars or coffee and juice essentials. 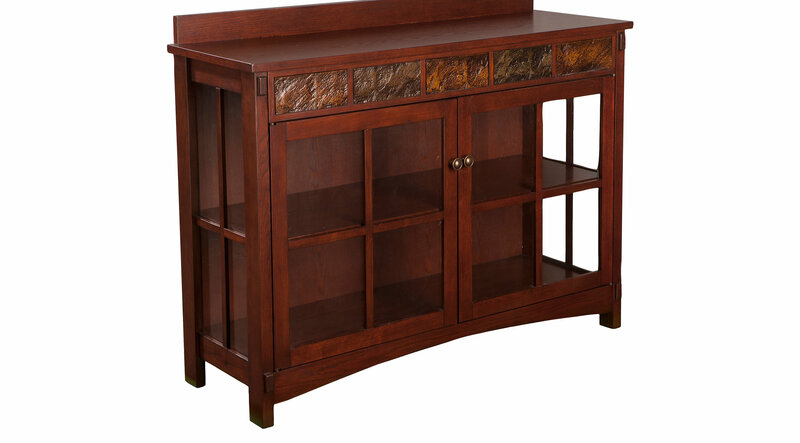 Open the door to a world of storage options with this sideboard curio as a buffet in the dining room, walk-by closet in the powder room, or display cabinet and media center in the living room. Authentically textured synthetic stone will vary. Customer assembly required.